Works with tablesaws, router tables and even bandsaws! This easy to use jig will allow you to make repetitive thin rip cuts on the left side of the saw blade on your tablesaw. This eliminates the danger of binding the stock between the blade and the fence reducing the risk of kick back. Whether you need to cut two strips or two hundred this jig makes any size job fast and simple. The jig incorporates a double locking system - A single large star knob secures the position of the jig and locks the jig into a standard 3/4" x 3/8” deep miter slot simultaneously. On the tip of the jig there is a ball bearing guide which keeps the stock firmly up and against the fence for great repeatability. 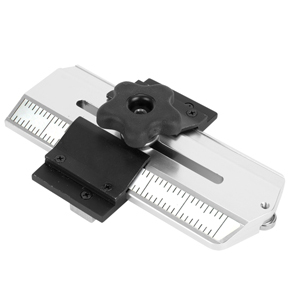 The main body of the jig is made from single piece of extruded aluminum for superior strength and durability. The thin rip jig adjust from 1-1/8" from the miter track to 5-1/2" away from the miter track for making various width cuts. For Craftsman and other undersized miter slots, It may be necessary to Sand down the side of the miter bar on the Thin Rip Jig for proper fit. Safety Note: When cutting thin strips on your table saw you must use a Zero-Clearance inset (sold separately) to prevent the stock from binding between the blade and factory insert. Master cutting thin strips of wood for edging, inlays, bent lamination and more. This easy to usa jig will allow you to make repetitive thin rip cuts on the left side of the saw blade on your tablesaw. This eliminates the danger of binding the stock between the sawblade and fence reducing the risk of kick back. Whether you need to cut two strips or two hundred, this jig makes any size job fast and simple by sliding your fence over touch the roller bearing after each cut. The jig incorporates a double locking system - A single large star knob secures the position of the jig and locks the jig into a standard 3/4" wide x 3/8" deep miter slot simultaneously. The tip of the jig has dual ball bearing guides which keep the stock up against the fence for repeatability. The dual guides also offer more surface area for the stock to contact. This eccentrically eliminates the chance of work piece rocking. 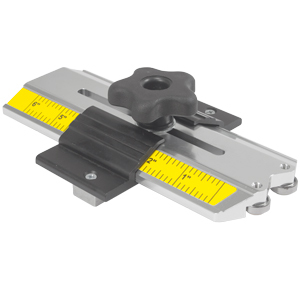 The main body of the jig is made from a single piece od extruded aluminum for superior strength and durability.The thin rip jig adjust from 1-1/8" from the miter track to 5-1/2" away from the miter track for making various width cuts.